This site is supported by the Scientist Professional Advisory Committee (SciPAC) and provides news and information to Officers in the Scientist Category of the U.S. Public Health Service (USPHS) Commissioned Corps. The Scientist Category is comprised of USPHS Officers who hold a doctoral degree (PhD, DrPH, DSc, PsyD, EdD) that served as the qualifying degree for their commissioning. The assigned billets and duties are diverse within the category and include a wide array of career tracks such as research scientist, regulatory scientist, environmental health scientist, epidemiologist, psychologist, and laboratory scientist. Currently, there are more than 300 Scientist Officers in the Scientist Category serving in 18 federal agencies or operating divisions. 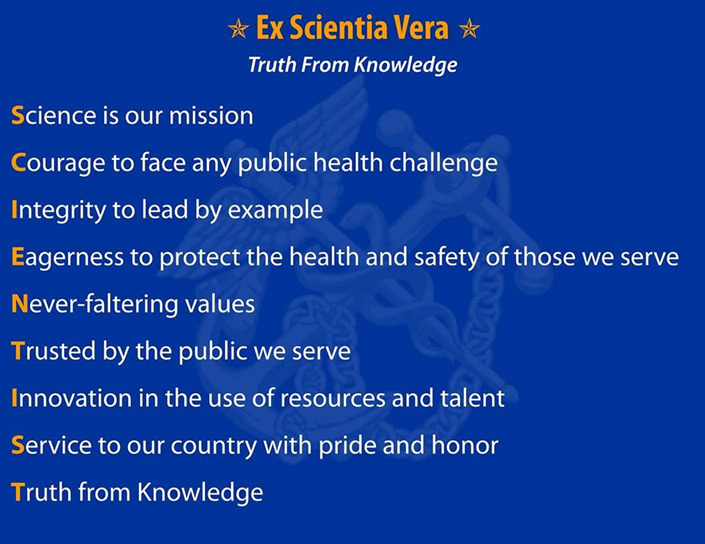 Each of the 40+ disciplines and professions within the Scientist Category contributes to the USPHS Commissioned Corps mission in unique and valuable ways. The SciPAC General Meeting is second Tuesday of each month from 1200–1300 Eastern Time,unless announced otherwise. The SciPAC Standard Operating Procedures (SOP) have been revised for 2017 and can be found here. Interested in fellow Scientist Officers' deployment experiences? Check out these narratives from officers who have recently deployed! Are you aware of the new changes to the APFT requirements? Take a look at this informative presentation - APFT updated 2016! Check out our Newsletter, August 2018. Read a recent article "K9 Training" by LT Scott and CDR Meites, an excerpt from COA's "Frontline", June-July 2018. Read our recent article, "Seven Prevention Priorities of USPHS Scientist Officers", published in the American Journal of Public Health. Meet our most recent OBC graduates, Feb 2018. Five new chapters of the Scientist Officer Handbook are available on Awards, Basic Readiness, COERs, Promotion, and Uniforms. If you are a new Officer, check out our Top Tips for Scientists entering the USPHS. For important news and information, subscribe to the Scientist Category Listserv. For benefits information, check out the Benefits Fact Sheet on the Policy Subcomittee page. Please check out SciPAC related events on our SciPAC Calendar (below). The news and information provided on this site is designed to support new and existing Scientist Officers in achieving their career goals. Resources are also available to civilian scientists interested in joining the USPHS Commissioned Corps. Welcome and please explore our website! This is the first RSS/News Feed for the osg site. What our feed for updates on our activities.